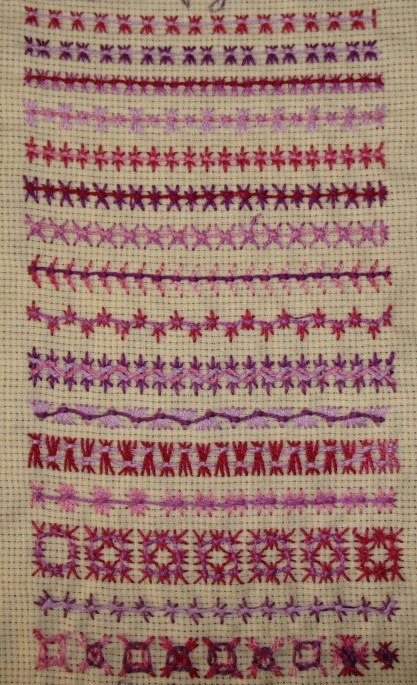 This week’s stitch of the TAST 2012 Challenge by SharonB is butterfly chain stitch. Before thinking of working on this stitch this week, I thought of posting the earlier variations done with this stitch , for a previous challenge. This stitch was part of the first TAST challenge, which was re-run on stitchinfingers in 2009, I participated then and worked some variations of this stitch. I was not blogging very seriously then, so did not post this stitch here. 1. The first two lines , I was practicing this stitch, the third row, the butterfly chain stitch was done alternatively on two and three straight stitches. 2. 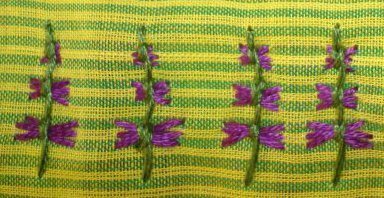 The first row, long and short straight stitches are tied with butterfly chain stitch. In the next row the straight stitch in the middle is longer than the corner two. 3. This is also a straight stitch variation, one stitch is the same as the previous row , another one , the corner stitches are longer than the middle one. The next row , is done with four straight stitches, the middle ones shorter than the corner ones. 4.in the first row, the three straight stitches are worked from short to long, in the next row,another variation of straight stitches are worked on two levels and the butterfly chain is worked on them in zigzag pattern. 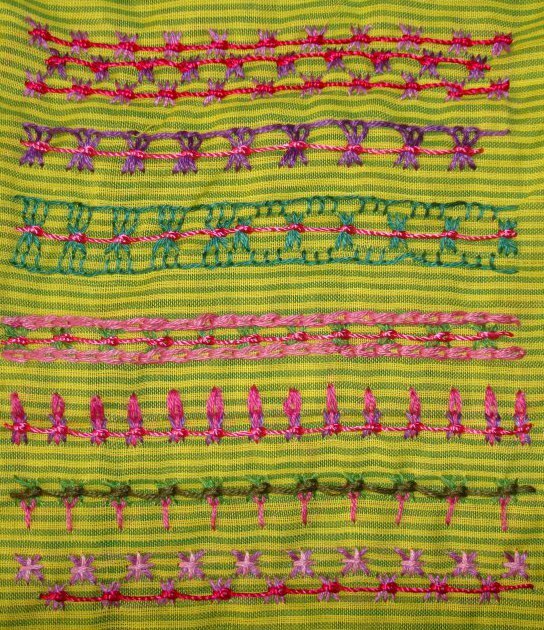 5.in the first row, long straight stitches are worked, and the butterfly chain stitches are worked in two colours in zigzag pattern. In the next row, the straight stitches originate from the same point and fan out in opposite directions and the butterfly chain stitches are worked in zigzag pattern . 6.First row, the straight stitches are long, and two rows of butterfly chain stitches are worked on alternate set of straight stitches. The next row is a trial of five straight stitches of varying heights, does not look so great though! 7.This is a variation of working butterfly chain stitches in a square. 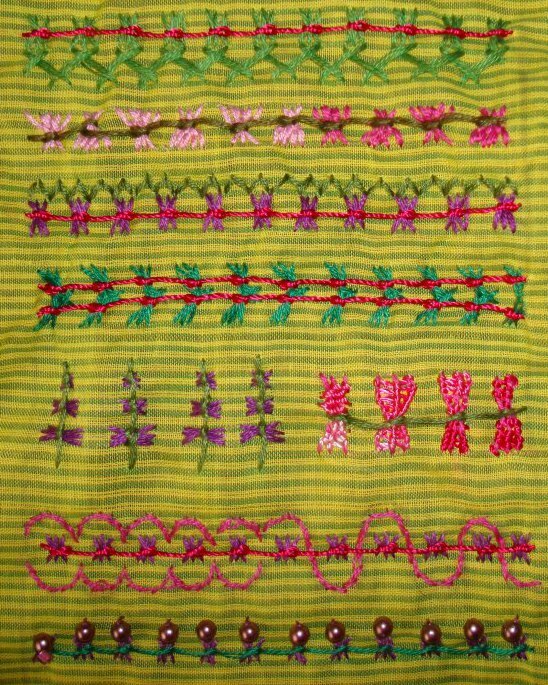 8. the first row, the straight stitches are worked diagonally, and butterfly chain stitches are worked on them. The last row , are the trials of working butterfly chain stitch in a square.